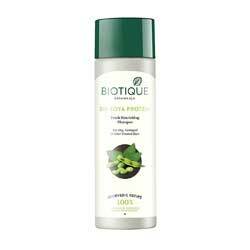 Bio Soya Protein Fresh Balancing Shampoo - Helps undo the damage caused by perming & blow drying. Bio Soya Soya Protein Fresh Balancing Shampoo For Color Treated & Permed Hair. Soya Protein has been a major source of nutrients for over five thousand years, providing all the essential amino acids for human nutrition. This rich shampoo is a blend of pure soya bean protein, berberry and wild tumeric extracts to cleanse hair without disturbing its natural pH balance. Prevents color fade. Protects a perm. Promotes healthy shine. Organically Pure & Preservative Free. No Animal Testing.